Nov. 1, 2015 Montreal. The North Shore Lions are headed to the big show 1 more time to try and win championship #36. On Sunday Nov. 8, 11:30am at Stade Hebert in St. Leonard the North Shore Lions will be playing against the Laurentien Wildcats for the QBFL Cup, emblematic of the Provincial Championship. Oct 1, 2015 Montreal. Hello friends, we are back. Yes the Lions are at it again. The 2015 campaign is well under way. The Lions sit in 1st place with a 7 - 1 record and can win the division again, by closing out the season with 2 more wins. The roster, schedule and standings pages have been updated. June 1, 2015 Montreal. The North Shore Lions together with the North Shore Mustangs will be hosting a Bantam-Midget Jamboree. The Jamboree will take place at GFM field in DDO on Saturday June 27. For details on teams and schedule please click on more info. April 11, 2015 Montreal. The North Shore Lions open Spring training camp at the indoor complex in Baie d'Urfe. March 21, 2015 Longueil - 2014 QBFL Banquet. The QBFL honored its league players with the annual Banquet Awards. The North Shore Lions took home a lot of hardware, 9 players picked up individual awards. The team also picked up the 1st place and League Championship trophies. However, the biggest surprise of the day was the Coaching Staff was named Coaching Staff of the Year. An amazing feat by rookie head coach Terry White and his staff. Congratulations to all the boys and staff. February 11, 2015. Montreal - The North Shore Lions kick off their winter dryland training program at Olympia Performance training center in Kirkland. Every Wednesday evening at 7PM. October 22, 2013. Montreal - The Laprairie Diablos forfeited their upcoming quarter final game vs. the Lions. The Lions move on to the semi-finals on Saturday Nov. 2, 1PM @ Riverdale against a yet to be determined opponent. October 14, 2013. Montreal - The 2013 QBFL Season is coming down to the wire. This Saturday afternoon the 8-1 Lions travel to the 9-0 Laurentien Wildcats to decide who will finish in 1st place. The Lions only loss of the season was to the Wildcats. March 23, 2013. Longueuil - The 2012 QBFL Banquet was held at Place Deslauniers in Longueuil. Over 650 guests attended this year's banquet. The Lions team was on hand to accept, team and individual awards. The Lions received were winners of the 2012 Bill Allan trophy awarded anually to the team that finished first in the standings. Also the following individual players were honored for their accomplishments in 2012. Click on this link for more pictures of the banquet. March 1, 2013. Registration information for the 2013 North Shore Bantam (Lions - Cheetahs) season is now available. January 14,2013. The North Shore Lions announced the start of a new off season FREE training program for prospective players. 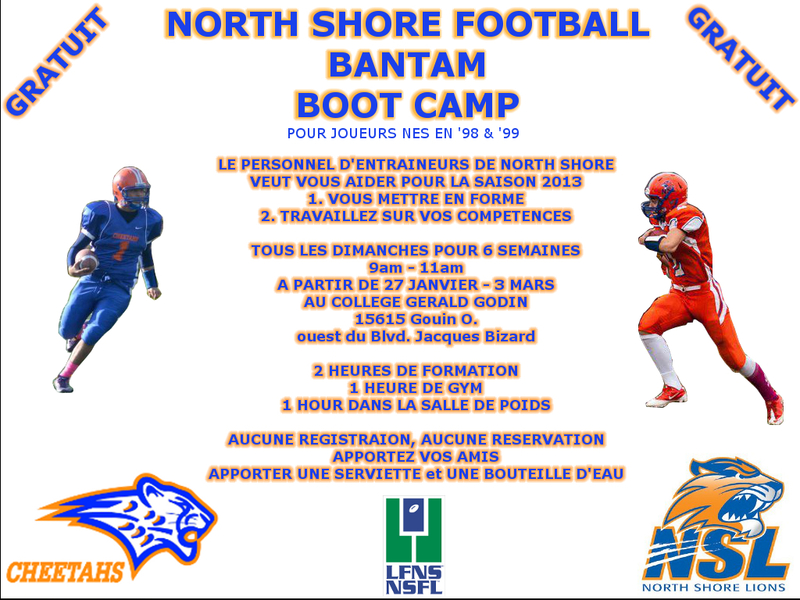 The North Shore Football BOOT CAMP. The North Shore Football coaches will put the future prospects thru an intensive training regimen to prepare them for the upcoming indour and outdoor 2013 season. The BOOT CAMP will be 2 hour sessions every Sunday for 6 consecutive weeks starting January 27 at College Gerald Godin on the West Island. See the below for more details. BOOT CAMP flyer in english. BOOT CAMP flyer in french.